Hi All! 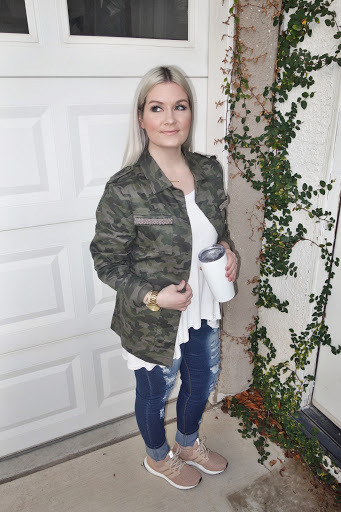 I've been getting some inquiries on the jeans I've worn in my last couple posts, so today I wanted to give you some casual outfit inspiration with these errand-worthy threads, and talk about this pair of jeans that I can't stop wearing. These ripped skinny jeans are from Rosegal, and are the most comfortable pair I've worn in a really long time. They are not jeggings, they are jeans, but they have an amazing amount of stretch in them to help fit my body in all the right places. Being completely real....This is one of my first pair of jeans since giving birth to my little boy Winston. I haven't quite made it to my goal weight, so when I was on the hunt for a pair of jeans, I need forgiving fabric that still looked stylish with an on trend wash. These are super reasonable at only $25, so when I need the next size down, I'm not going to break the bank. The fit is true to size and the wash is best see in all images below this text. "The Sweetest Sale" is going on now for Rosegal Valentine's Gifts with almost 80% off sitewide. Use code LOVE24. Grab items from their Best Valentine's Gifts for 2018 selection, the sale ends tomorrow. Those jeans are super cute. I’m always a sucker for ripped jeans. This is my first pair in a long time. I love them. These are seriously so cute!!! That is how I feel about my Levi's that I just got, I never take them off!! OOH I have to try those jeans! The look and sound fantastic! Thank you. Super comfy (FOR REALS). I hate to admit it... I’ve never owned a pair of ripped jeans! I’m checking these out, they look fab on you! They are my first ripped pair. Love them! Great post... I love all of your shoes too!